Caffeine Fix: Giving Up Taste for Presentation? This dainty little cafe has been a craze in Pinky’s circle of friends…and even on our dear friend, Yelp. However, does it really live up to the hype or are we setting ourselves up for disappointment? Victor and I — along with our previously featured friends, go in to discover for ourselves. We basically ordered different things to try out most of their menu. They offer things from the various waffles, ice creams, honey toast, hot drinks, virgin mojito (Pinky was veeery skeptical of whether or not that would taste remotely good), and your assorted frappe flavors. I’m no coffee shop expert or whatever, but this place is pretty nice. The decor is very modern and the cashier was kind. Has a lot of “wooden” decor features, which I’ve been noticing a lot in restaurants and cafes lately. So I ordered a virgin raspberry mojito. A pretty weird thing to order from a coffee shop, but I wasn’t looking to get my caffeine fix that day. The virgin raspberry mojito is very very sweet, but minty too. It will probably be too sweet for your average person, but I do have sweet tooth. It could have been nice with half the sweetness, but they also put a lot ice, which diluted it a lot later on. It was about $4.50 for a medium sized drink. I also tried Pinky’s green tea latte. It was weird but okay. 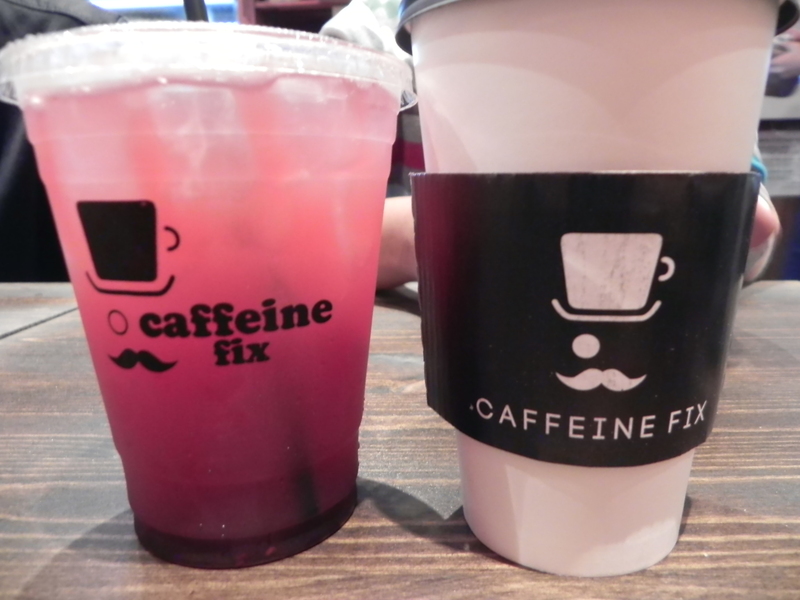 Their hot drinks are really… like REALLY hot when you first get it. I burned the tip of my tongue taking a sip out of her drink. Pinky will go in more dept of what she thought of that drink. I couldn’t really taste it too much. 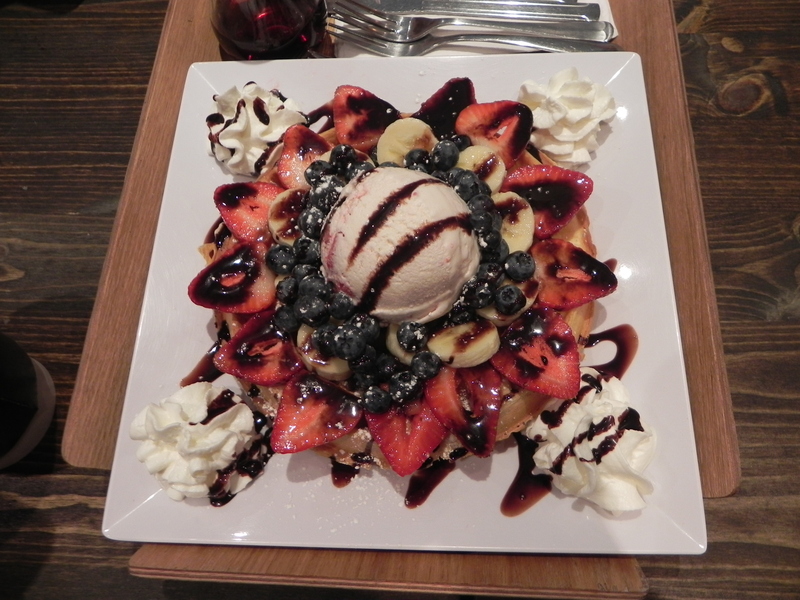 We ordered a very berry belgian waffle ($12) which can serve 2-4 people. The presentation of this dish is beautifully done and its like art. The waffle itself is just okay. I personally think Wafels and Dinges is still so much more better. The chocolate syrup on this very light, so you don’t get a whole lot of chocolate taste. You do however get a bunch of fruits: blueberries, strawberries, and banana slices! On top of everything, you get a big scoop of your choice of ice cream. Overall… things are bit expensive here, but I suppose its aesthetically nice here. Not something to go out of my way for. I’m not even sure why this place has such a high rating on Yelp. First of all, okay I give points for decor, but the seats weren’t even comfortable. Mary and I were sitting on the bench seats because everyone else took the comfortable (?) sofa seats. They obviously don’t want you sitting there long! The prices are way too expensive based on the quality they serve. I get the whole logo cuteness, and presentation I give an A+, however the quality has to step up its game, BIG TIME. My green tea latte tasted like edamame (soy bean) milk. I have no idea why, but BLEGH. Even the green tea latte from Paris Baguette is a lot better. Not to mention it took me forever to even get to the liquid part because there was 3+ inches of FOAM in my medium sized drink. I mean I LOVE foam, but if it takes up more than the entire top of my cup, I’m already wanting my money back. The waffles…you might call me crazy because you see all these beautifully crafted dessert places, but seriously I’d rather have an ugly looking dessert and have it taste AMAZING, than have a beautiful dessert tasting like nothing…I’ll admit the fruit is fresh and the ice cream okay. It is NO waffels and dinges though, I’ve been spoiled, I guess. Later, we found a fruit fly in the waffle…not sure if it was there all along though! Juuusst saying…hahha. I was very skeptical that the virgin mojito would taste good, but Victor being the daredevil he is.. lol ordered it. The “virgin mojito” tasted like those sour patch kids candy except the flavors happen in reverse. It is suuuper sweet then suuupper sour with the after-taste…blegh. I was tricked by their cute marketing tactics and the pictures!!!! No. Don’t make my mistake. Posted on September 18, 2013 September 30, 2013 by pinkytwinkieeePosted in New York, queensTagged asian, cafe, coffee, dessert, drinks, flushing, food, fruits, hip, ice cream, korean, latte, long island railroad, mojito, murray hill, sit-down place, strawberry. Previous Previous post: Press 195: Are they REALLY “Sandwich Kings”? Next Next post: Kimganae Korean Restaurant – Korean Sushi!?! ?